Being a die-hard football fan comes at a cost. If you want to spend your Sunday cheering on your favorite team in person, you better be prepared to open your wallet. Tickets for two, parking, and a couple of beers and hot dogs will cost you more than $200 at many NFL stadiums, according to an analysis by GoBankingRates. The high cost of attending an NFL game might be causing some people to stay home. When stretched family budgets are combined with expensive tickets, some fans are forced to choose between a beloved tradition and not going broke. At close to $90 per person, the Eagles have some of the most expensive tickets in the NFL. Parking costs as much as a ticket to a game at AT&T Stadium, home of the Dallas Cowboys. At $75 per car, it’s the most expensive in the NFL. At $10 for a 16-ounce beer, drinking at Levi’s Stadium in Santa Clara, California, is more expensive than at almost every other NFL stadium. Only Philadelphia Eagles fans pay more per ounce. Redskins fans pay more to attend a game than supporters of any other NFL team. Everything from tickets to parking to beer is more expensive at FedEx field, even though the team hasn’t won a Super Bowl since 1992. "With a family of four in today's economy, [attending games] is not something that's a top priority, even though that's something that's a really big deal to my family," Melissa Lambert, a Washington Redskins fan, told ABC News. Is there any way for die-hard fans to save when going to an NFL game? If you're patient, you may be able to score cheap-ish tickets a day or two before the game using websites like Vivid Seats, StubHub, or SeatGeek. "Generally it pays to wait until the last minute to buy a ticket as sellers are more willing to drop their price once the event gets closer," Cameron Papp, a spokesperson for StubHub, told TheStreet. "However, this isn't always the case. If a team starts doing well, demand will increase and ticket prices could rise." Bringing in your own snacks can help you cut down on costs too, though not all stadiums allow it. Off-site parking can save you even more money, and some NFL stadiums are accessible via public transit, so you won't have to pay to park at all. Is your favorite team one of the most expensive for fans? Keep reading to find out. 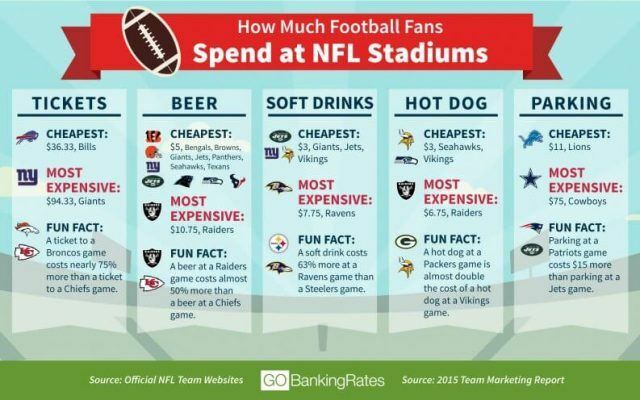 Rankings based on the cost of two tickets for a home game, one beer, hot dog, and soda per person, and parking.